Were you to look at a map of all the known cenotes that dot the Yucatán Peninsula in Mexico, you might very well think you were looking at a piece of Gouda, so numerous are the cenotes that litter this part of the country. 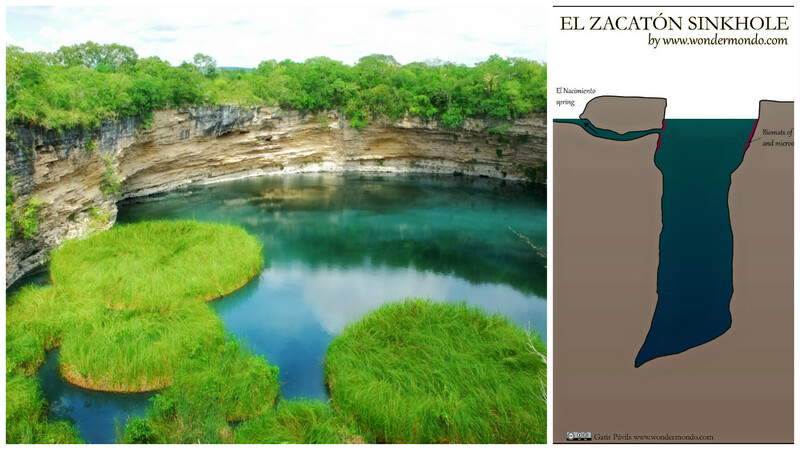 Formed when the soft limestone is eroded over hundreds of years, they are essentially sinkholes, often connected by underground cave systems and while there are more than 7,000 across Mexico (not just in the Yucatán! ), here are some of the most beautiful. Let’s get the obligatory Cenote Dos Ojos mention over first. As one of Mexico’s most internationally well-known and popular cenotes, you can’t really visit the country without at least stopping by. 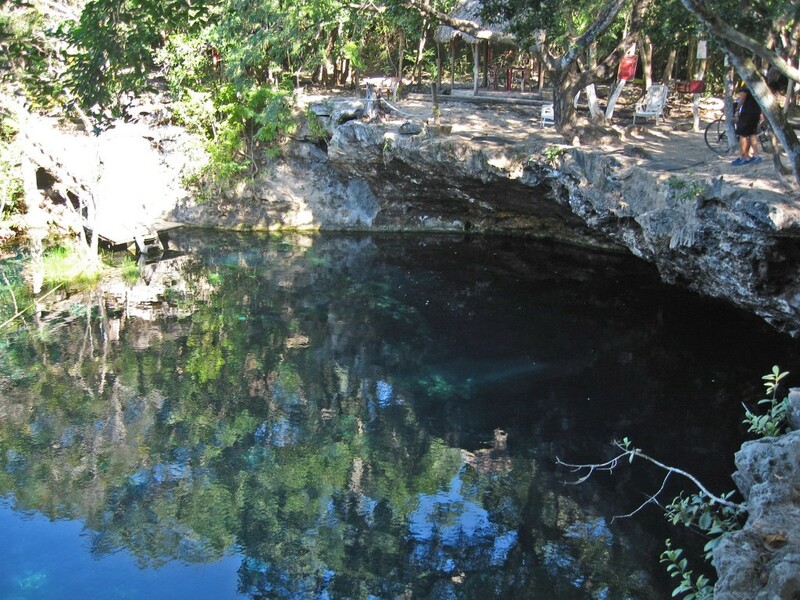 The name Dos Ojos (literally ‘two eyes’) comes from the fact that the cenote itself is split in two – one half is lighter and shallower, perfect for snorkelling, whereas the other half is darker, deeper and ideal for scuba divers. After you’ve visited the Cobá ruins, don’t just head straight back to your accommodation. 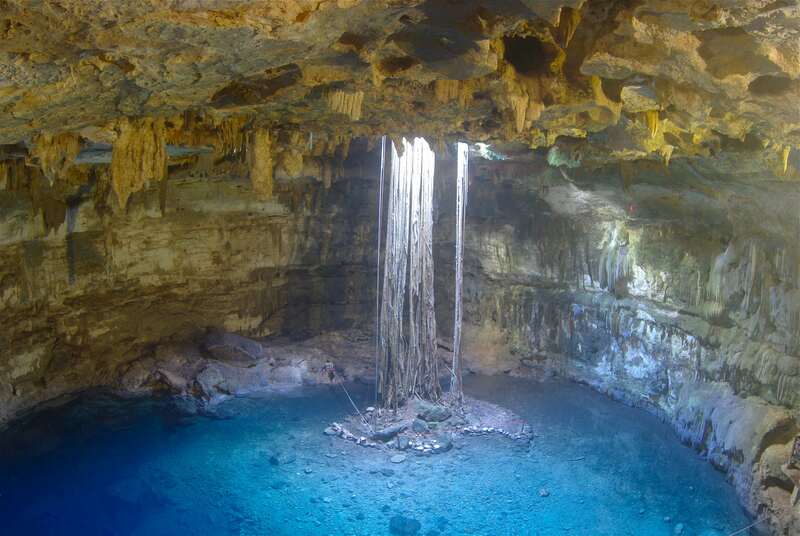 Instead go to Cobá itself and explore one of the three cenotes that are to be found there. All three are underground, unlike many cenotes you’ll find in the region, and Choo-Ha is best known for stalagmites and shallow waters perfect for children. The other two, Tamcach-Ha (better for the daredevils who love to jump into the water) and Multun-Ha (a scuba diver’s dream) are also worth visiting. A lesser-frequented cenote, you might find that on certain days you have Cenote Zací all to yourself. More popular among residents than tourists, this below ground pool is relatively small but perfectly formed and you can jump off a rather terrifyingly high looking platform or simply walk down the outer edge of the cenote to reach the stairs that lead you into the water. 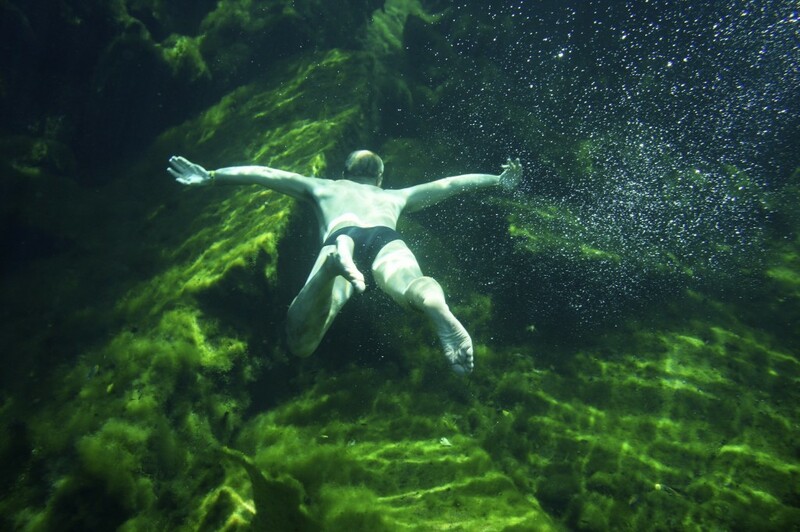 It’s incredibly tranquil and the entry fee is lower than many equally attractive cenotes. This picture-perfect cenote destination near to Puerto Morelos is incredibly deep, making it perfect for divers, but also beautifully blue and enticing, meaning a ton of swimmers also flock there. 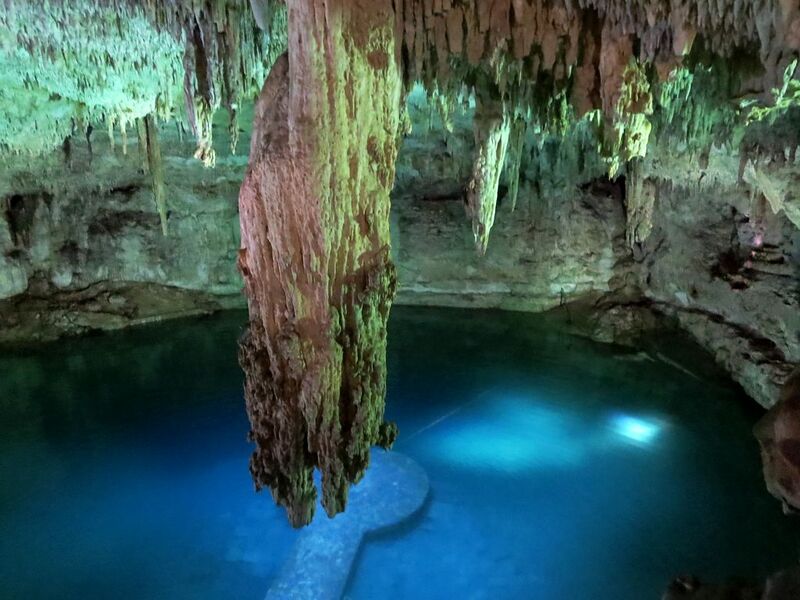 However, the real draw of this cenote is the inspired addition of a swing in one of the caves and the floating platform at the centre of another. You’ll feel like you’re hanging out on a film set. Another classic of the Mexican cenote trail, Cenote Azul, is a favourite for a reason. It is surrounded by lush vegetation and boasts crystalline waters in a pleasingly blue hue (hence the name ‘Blue Cenote’) which seem almost unreal. Even though it’s well-known, you shouldn’t feel like its overrun with people, and the mixture of shallow pools filled with tiny fish and deeper waters that attract many a diver, mean you can either wade into the water or jump from the cliff. 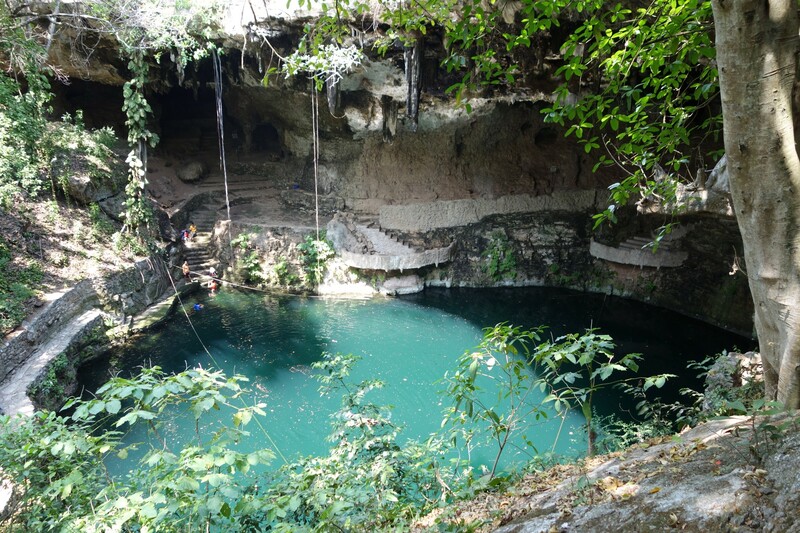 Just 8km outside of Valladolid, in Yucatán, you can find this rural cenote situated in a complex of cabins. 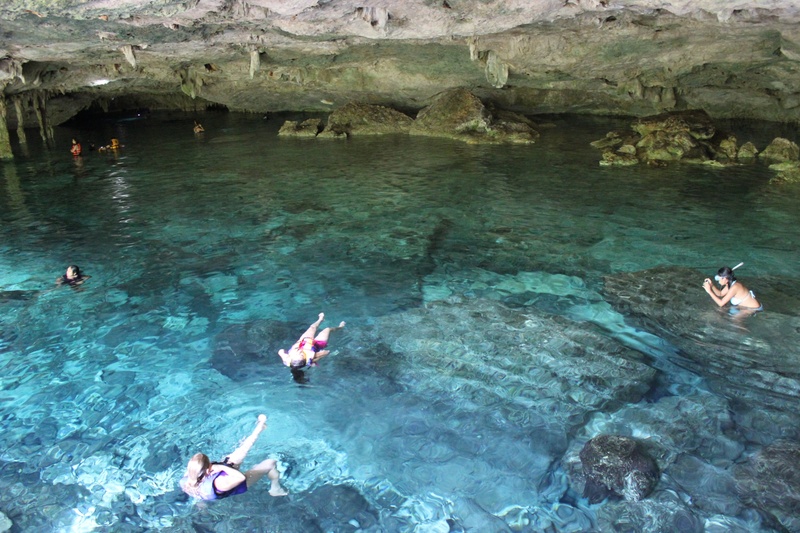 Make the most of your visit and stay in one of them, before checking out the nearby museum and exploring the underground cenote with its shallow waters and fish flitting about below the impressive stalactite formations, making it a prime photography spot. The central ‘viewing platform’ is pretty cool too. Located in a remote town just a 15-minute drive from the famed archaeological site of Chichén Itzá, is the freshwater Cenote Yokdzonot. Run by a group of Mayan women, this cenote is relatively ‘new’ on the scene and so you should get there soon before tourists catch on to just how great it is. The cool water is especially refreshing in contrast to the heat of the surrounding jungle and the on-site Yucatecan food is amazing. This cenote goes by two names, so don’t be confused if you turn up to find it’s called something other than you expected. Cenote Ponderosa, otherwise known as Cenote Jardín del Edén, is more like a huge open-air swimming pool than anything else, hemmed in by verdant plants and trees that will make you feel like you’re a million miles from civilisation. Once the site of Aztec sacrifices, it’s now better known for translucent, green-tinged waters and friendly wildlife. 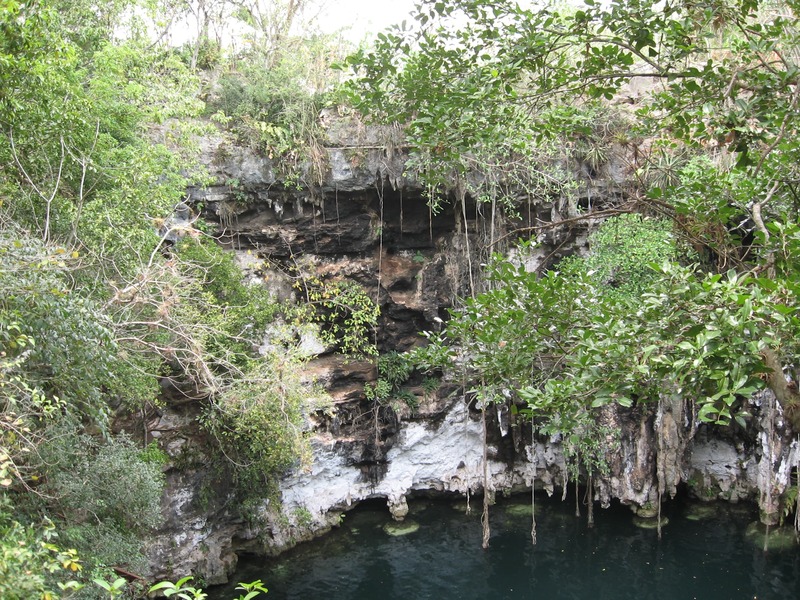 One of the most photogenic of the Yucatán’s many, many cenotes, Cenote Samula (also known as Cenote Dzitnup) is a must-see. You reach the pool by descending stone and then wooden stairs, before arriving to the viewing platform at which you can get ready to make your way into the water. The centrepiece of the cenote is the root system which drops down from the hole in the ceiling some eight meters above your head, forming a strange pseudo-island in the water below. Finally, to break away from the typical cenote trail that centres on the Yucatán Peninsula, we recommend paying a visit to El Zacatón in Tamaulipas. This is considered to be the world’s deepest sinkhole and has long been a favourite of professional divers hoping to fully explore its depths. While you shouldn’t swim there, it certainly makes for a unique cenote destination, not least for the floating island of zacate (grass) that calls it home.